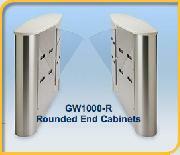 Wipaq offers the GW1000-R glass wing optical turnstile which forms an easy barrier to entry by mischievous people. The optical capability lets only those who have the right papers on them. This can be converted into a free zone by just an off button making it easy to pass through. Made of high-quality material, it adds aesthetic value to an area.